Bill McKibben, influential environmental author, journalist and creator of 350.org, spoke at the college about climate change activism and sustainability April 11. Bill McKibben, influential environmental author, journalist and creator of 350.org, a website devoted to climate change activism, said activism is the most important tool in the fight against climate change during a presentation at Ithaca College on April 11. 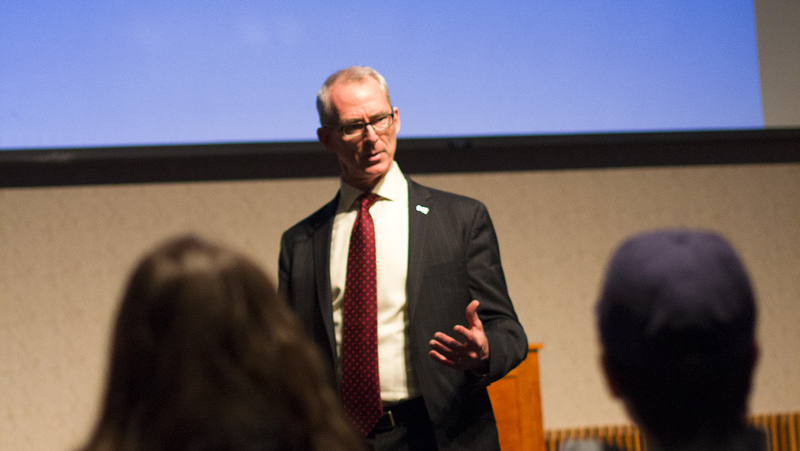 The presentation, titled “Hot Times: Reports from the Front Lines of the Climate Fight,” was a part of the college’s second annual sustainability week. Approximately 500 people were in attendance at the event. In 2006, McKibben organized the largest demonstration against climate change that had ever taken place in the United States. Three years later, 5,200 demonstrations against climate change occurred in 181 countries on October 24, 2009, as a result of his efforts. The fossil fuel industry is able to continue contributing to global warming without major repercussions largely because of its financial power, McKibben said. Therefore, activists must rely on means other than money to make changes toward sustainability. McKibben said he has no doubts that the world will eventually run on renewable energy, but he is worried the planet will be too damaged by the time this occurs. The planet has experienced significant warming because of increased greenhouse gases in the atmosphere, according to NASA. This includes shrinking ice sheets in Greenland and Antarctica, rising sea levels and increasing amounts of extreme weather events. McKibben said the fossil fuel industry knew about global warming and many of its consequences as early as thirty years ago but neglected to share this information with the public. During a Q&A session, Tim Joseph, former chairman of the Tompkins County Legislature, said he has trouble finding meaning in environmental activism because he said he feels there is no longer hope that we can keep the planet from reaching catastrophic collapse. Regardless of how hopeless the current situation may seem, people must continue to advocate for changes that could help us move toward sustainability and minimize the overall damage to the planet, McKibben said. The planet has already experienced irreversible consequences of climate change, such as severe annual coral bleaching as a result of rising ocean temperatures. According to National Geographic, 75 percent of the planet’s reef systems have gone through severe bleaching in the past three years. Human health has also been impacted in significant ways that will not necessarily improve even if emissions are lessened. For example, the rising average temperature of the planet has increased the spread of dengue fever, a mosquito-borne viral infection which was originally present in only nine countries. McKibben said he contracted dengue fever while in Bangladesh, but said he was able to recover because he was well–fed and healthy when he contracted the disease, unlike many of those who die from it. Dengue fever is now present in more than 100 countries. Even if all greenhouse gas emissions were to stop today, over the next few decades the surface temperature of the planet would still increase by approximately 0.6 degrees Fahrenheit. Junior Mike Hanlon asked McKibben about the personal responsibility of each individual in living sustainably. McKibben said the real change lies not in personal lifestyle changes, but rather in large demonstrations and activism which pressure governments and corporations to change their practices. He also said individuals should feel encouraged to take personal responsibility for combating global warming, but these lifestyle changes are not as effective as uniting with those around you to advocate for change. Greg Lischke, director of energy management and sustainability, said he was glad the event was well–attended and hoped that audience members take McKibben’s guidance and insight into account moving forward. Freshman Bruce Franz said learning about the origins and development of McKibben’s activism orgnaization 350.org was his favorite part of the presentation. The organization was named after the safe concentration of carbon dioxide in the atmosphere, 350 parts per million, and was created to unite environmental activists globally.